The badlands of Dandero today. A million years ago, Dandero was a very different place. 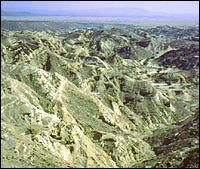 Instead of the dry, dusty badlands that characterize the area, there were flowing rivers, lakes and lush forests. Animals thrived in the much wetter climate. The proof is in the more than 500 metres of sedimentary rock stacked one on top of another, like a layer cake, for hundreds of square kilometres around. 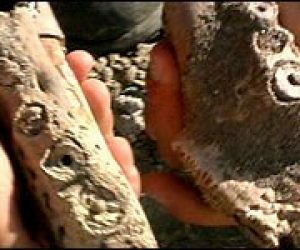 Embedded in the rock are the fossilized remains of hundreds of land mammals: elephants, hippos, antelope, pigs, horses; water animals like fish, crocodiles and turtles; and plant and invertebrate fossils like land snails. Even pollen remains are part of this unusually rich fossil record. Bob Walter, director of the Eritrean Research Project, calls the whole area ‘Pleistocene Park’ because “we have such a long record of Pleistocene sediment in this area.” He’s spent the last three winters in Eritrea studying this unexplored terrain. 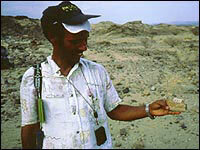 Eritrean colleague Michael Abraha holds a jaw fragment of a land mammal. CLICK for a closer look. 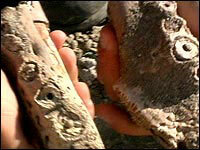 The Pleistocene refers to a time period between 1.7 million and 10,000 years ago. And a rough calculation of how much time is represented in the sediments of Dandero is on the order of a million years. So what do the sediments tell us? While no hominid fossils have yet been found, a lot can be said about the people who must have hunted the animals a million years ago – especially since thousands of stone tools were also left behind. Finding fossils and stone tools in sedimentary rock layers is like finding the campsites of the people, explains Chazan. It becomes highly interpretive at this point, says Chazan, but the division of particular parts of an animal can tell us something about how the society was ordered. 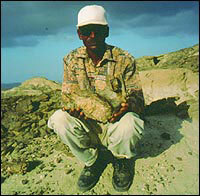 Berhane Negassi with a fragment of an elephant jaw. 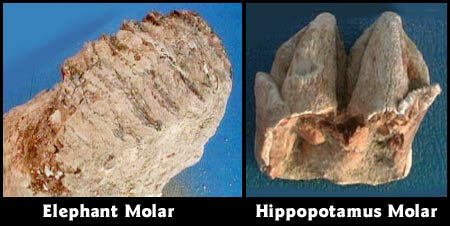 CLICK for a closer look at elephant and hippo molars. The sedimentary rock is also witness and recording secretary to multiple climate changes, from warm, temperate periods, like the one we’re in now, to extreme ice ages. “We see periods of these lush, wet conditions – lake and river environments – and then we see areas of sediment that are indicative of climate drying, thinly laminated beds of gypsum and salt called evaporate deposits [when the climate was much colder],” says Walter. During the Pleistocene, the world went through extreme weather cycles, enduring numerous ice ages once every 100,000 years. The animals and toolmakers whose remains are left behind in Eritrea were undoubtedly affected by global climate change. And these climate changes may also yield clues into key transitions in human evolution. Our earliest ancestor, a bipedal primate, branched from our common ancestor with the great apes about six to four million years ago. Scientists believe that climate was key to this first evolutionary transition. At about the same time, shifting tectonic plates created a range of volcanoes north–south between East and Central Africa. This mountain range created what’s called a ‘rainshadow’ in the elevated countries to the east (Tanzania, Kenya and Ethiopia): Moist air from the Congo Basin hits the mountains, then dumps the moisture in the form of rain. But, once the air passes east over the mountain range, the lack of moisture produces a drier, hotter climate in the eastern countries. “So you’d have a kind of chimp-like animal living all over central Africa. But, the population, isolated in East Africa in the drier conditions, started changing and eventually became humans – that would be a simplistic way of looking at it,” says Mario Gagnon, a paleoecologist at the University of Toronto and member of the Eritrean Research Project team. A drier climate would lead to more open vegetation, so forested habitats would thin out, leaving only patches of trees isolated from each other. At this point in human evolution, trees would still provide safety – from other predators – and food. So, instead of leaping from tree to tree closely set together, our earliest ancestors evolved to walk from tree to isolated tree. “The idea is that walking on two legs would give a special advantage in that condition,” explains Gagnon. Bipedalism would then free up two hands, which would enable our early ancestors to carry things. It would also allow for a more efficient method of moving across long distances. While walking on four legs might be faster in small bursts, two legs demand less energy when walking long distances, says Gagnon. The second key transition occurred at about 2.5 million years ago with the appearance of Homo erectus, a member of our own genus. These early ancestors began crafting stone tools rather than picking up rocks with convenient shapes. Utilizing this new skill, they started eating meat. Then, somewhere between two and one million years ago, came the dramatic growth of the brain and our ancestor’s first migration out of Africa. At about 100,000 years ago, emerged what are called anatomically modern humans – ancestors who resembled us. This new group made a second migration out of Africa. An exploration of climate changes in Pleistocene Park may yield clues into the latter evolutionary changes – how and why we developed bigger brains and left Africa, and how we came to resemble the Homo sapiens we’ve become.